How to grow strawberries in Ireland. I found this interesting article recently so I decided to put together to help you all grow this great fruit. The strawberry is a very important fruit, and most amateurs attempt its culture--many, however, with indifferent success. This is due, partly at least, to the fact that many methods are advocated by successful growers, and that the beginner is not likely to pick out one and stick to it. Firstly, the soil should be well drained and rich--a good garden soil being suitable. The strawberries should not follow grass or corn. If farmyard manure is used it should be old and well rotted, so as to be as free as possible from weed seeds. Potassium, in some form should be added. The bed should be thoroughly prepared, so that the plants, which need careful transplanting, may take hold at once. A good sunny exposure is preferable. Although you can get a harvestable crop with as little as six hours of direct sunlight per day, the largest harvests and best quality berries come from those plants that get the advantage of full sun. A spot where no water will collect is essential. Although strawberries won’t thrive in water saturated ground, they do need a slightly moist environment. Amending your soil with a good supply of nutrient rich organic matter to both improve aeration, drainage, and increase moisture-holding capacity. The shallow rooted strawberry plant is poor competition for weeds, shrubs, trees, or other plants. Till a garden bed in the Autumn to eliminate a lot of the weeds that cause problems during the growing season. Choose a spot away from large trees, which may send roots into your strawberry bed. Also, be sure to locate your strawberry bed away from any spot where you have grown peppers, tomatoes or potatoes. These plants can harbor verticillium wilt, which is devastating to strawberries. • June bearing strawberries produce a large, voluptuous crop of berries in late spring. Mother plants send out runners (daughters) that root and develop into matted rows. The disadvantage to June bearing strawberries is 1) they only bear fruit once a year and 2) the first year you need to pluck all blossoms from your plants to let them become firmly established. • Ever bearing strawberries really aren’t “ever” bearing, but do produce a harvest twice a year, once in spring and again in autumn. During the first year, pluck all blossoms from ever-bearing cultivars through the end of June. After that, they will blossom again and set fruit for a fall harvest. • Day neutral strawberries frequently produce a crop of small, but very sweet berries throughout most of the growing season. 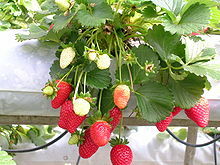 After plucking off the first set of blossoms allow the fruit to set and you’ll have strawberries throughout the summer! • The Alpine Strawberry is a cousin of the wild strawberry and is very much at home lining a path or walk way. In fact, the only strawberry that is regularly started from seed, the Alpine strawberry is a day neutral cultivar that makes an excellent ground cover with headily fragrant blossoms and very tasty red or white strawberries. The Alpine Strawberry reseeds profusely from its own strawberry seeds and bears fruit throughout the growing season. The best time to purchase strawberry plants is autumn. You may also order new plants for spring delivery. Thirty plants provide enough strawberries for a family of four. Select your plants carefully and purchase only virus-tested transplants. In planting soil-rooted layers, it is generally more satisfactory to set them out in spring, as soon as the ground can be worked, although they are sometimes set in early autumn--August or September--when the ground is in very good condition, so that a good growth can at once be made. Care should be used in transplanting. Have the bed fresh; keep the plants out of the soil as short a time as possible; set the plants in straight, and firm the soil; set just down to the crown--do not cover it. If the soil is dry, or the season late, cut off all old leaves before planting; also shorten back the roots about one-third and be sure not to crowd them when setting, for which purpose a trowel, not a dibber, should be used if the condition of the ground makes the use of any implement necessary. If the soil is dry that water must be used, apply it in the bottom of the hole. If very hot and dry, shade for a day or two. In the hill system the plants are put in single rows, or in beds of three or four rows, the plants one foot apart and the rows, or beds, two or three feet apart. In either case each plant is kept separate, and all runners are pinched off as fast as they form, the idea being to throw all the strength into one strong crown. In the matted row system the plants are set in single rows, and the runners set in the bed at five or six inches each side of the plants, and then trained lengthways of the row, this making it a foot or so wide. The runners used to make these secondary crowns must be the first ones sent out by the plants; they should be severed from the parent plants as soon as well rooted. All other runners must be taken off as they form. To keep the beds for a good second crop, where the space between the rows has been kept cultivated and clean, cut out the old plants as soon as the first crop of berries is gathered, leaving the new ones--layered the year before-- about one foot apart. spring. The pot-layering is repeated each year, and the old plants thrown out, no attempt being made to get a second crop. It will be observed that ground is occupied by the strawberries only the latter half of the one season and the beginning of the next, leaving ample time for a crop of early lettuce, cabbage or peas before the plants are set, say in 2006, and for late cabbage or celery after the bed is thrown out, in 2007. Thus the ground is made to yield three crops in two years--a very important point where garden space is limited. Whatever system is used--and each has its advocates--the strawberry bed must be kept clean, and attention given to removing the surplus runners. Cultivate frequently enough to keep a dust mulch between the rows, as advocated for garden crops. At first, after setting, the cultivation may be as deep as three or four inches, but as the roots develop and fill the ground it should be restricted to two inches at most. Before severe winter cold sets in (about the 1st to the 15th of December) the bed should be given its winter mulch. Hay, which may be obtained cheaply from some nearby farmer, is about the best material. Clean straw will do also. Cover the entire bed, one or two inches over the plants, and two or three between the rows. If necessary, hold in place with old boards. In spring, but not before the plants begin to grow, over each plant the mulch is pushed aside to let it through. Besides giving winter protection, the mulch acts as a clean even support for the berries and keeps the roots cool and moist. New strawberry plants can be grown from "layers." (2) by rooting the runners in the soil. In this method, two-inch or three-inch pots are used, filling these with soil from the bed and plunging, or burying, them level with the surface, just below where the crown is to be formed, and holding the vine in place with a small stone, which serves the additional purpose of marking where the pot is. (2) by layering in pots. In this method the plants are either allowed to root themselves, or, which gives decidedly better results, by selecting vines from strong plants and pushing them lightly down into the soil where the new crown is to be formed. In this method, two-inch or three-inch pots are used, filling these with soil from the bed and plunging, or burying, them level with the surface, just below where the crown is to be formed, and holding the vine in place with a small stone, which serves the additional purpose of marking where the pot is. In either case these layers are made after the fruiting season.